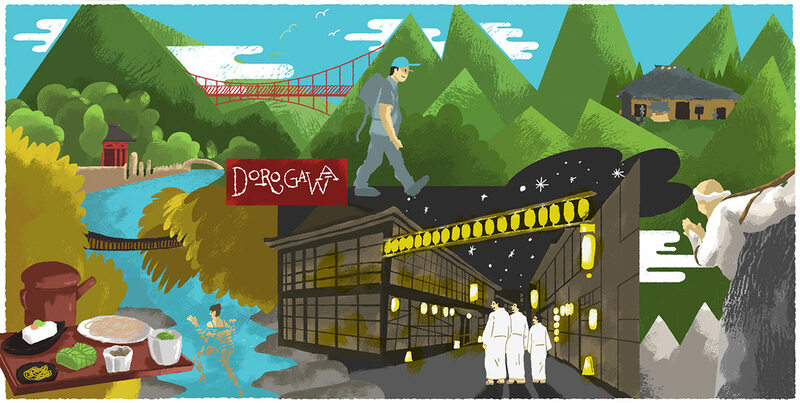 Deep in the southern mountains, the traditional hot spring town of Dorogawa retains a serene, spiritual atmosphere that draws pilgrims from around the world. The pure mountain spring water and hot springs that originate on sacred Mt. Omine have established the small town as a centre for relaxation and renewal and a popular escape from the summer heat. Staying in an onsen town means feasting on multiple courses of local specialties, relaxing in the natural hot springs and strolling the town in cotton yukata. Koryokuen Nishisei is one of the grandest ryokan in the area, with regional fare like wild boar hotpot. The town is dominated by Mt. Omine, a sacred mountain off-limits to women, and the focus of Shugendo practitioners who make the difficult pilgrimage to Ohminesanji Temple. However, nearby Ryusen-ji Temple is open to all, with beautiful gardens and fantastic legends about local dragons. Famous for its natural beauty, Mitarai Valley is a famous spot for autumn leaves, but it also provides scenic hiking courses in all seasons. In summer, it is popular for swimming and fishing. You will often see families picnicking and cooling off in the water. Another excellent way to escape the summer heat is to visit one of the limestone caves in the area. A fun option is Goyomatsu Limestone Cave which is reached via a tiny monorail through the forest. Riding this is just as thrilling as exploring the caves. For the full outdoors experience, consider staying at one of the numerous campgrounds in the area; many like Dorogawa Campsite offer tent, outdoor gear and BBQ rental services for the ultimate hassle-free camping experience. Shugendo is a psycho-physical practice from the Heian era, combining elements of shamanism, Shinto, Taoism and Buddhism. During a challenging hike up sacred Mt. Omine, practitioners seek to purify and revitalize themselves, becoming one with nature. The practice is exclusively male, and Mt. Omine is forbidden to women. The folk medicine daranisuke has roots in the esoteric Shugendo community practicing in the Yoshino and Omine mountains. Legend says it was developed by the sect’s founder. The dark black pellets made from tree bark are a natural remedy for maladies ranging from stomach aches to hangovers. Found in households throughout Nara, it is readily available at shops in Dorogawa and Yoshino. In 1985, Dorogawa’s spring water Gorogoro Mizu was recognized as one of 100 sources across Japan identified for their unique properties, surrounding environment, history and local efforts to conserve their purity. The name Gorogoro alludes to the gurgling sound of the spring's water which can be heard from within nearby Goyomatsu Limestone Cave. The water is as pure as it gets and can be drunk straight from the source. Summer in Dorogawa is a lively affair with Shugendo practitioners visiting to make pilgrimages to Mt. Omine. Seeing them stroll the small onsen town in traditional attire makes for a truly unique Japanese experience. The town and nearby Mitarai Valley also offer exceptional scenic views in both spring and autumn. The traditional hot spring hotels in the area attract visitors in winter. Dorogawa can be explored on foot with ease. To visit nearby Mitarai Valley, visitors can either take the scenic hiking trail, taking roughly two hours, or catch a bus. If you have an international driving licence, you may want to consider renting a scooter from the small gas stand near the tourist information centre. Dorogawa offers an off-the-beaten-path experience and requires some effort to reach by public transportation. Not all accommodation can be booked online either. It is advisable to check bus timetables in advance at a tourist information centre such as Nara Visitor Center & Inn; they can also help with finding accommodation. Note that most hotel rates will include dinner, as restaurant options in the area can be limited, especially outside of the peak summer season. Dorogawa is a popular destination for hiking, camping and barbequeing. Certain campgrounds offer rental services that include tents, camping equipment and BBQs. Check with a tourist information centre in Nara City for more information. The journey to Dorogawa involves several changes, with the last leg by bus. Total travel time is just over two and a half hours, but the journey can take longer when factoring in connections and waiting times. Make sure to check bus timetable information before setting out.